Feminine hygiene was already a big theme in 1949. I was suprised that the women back then had already tampons! Did you know? 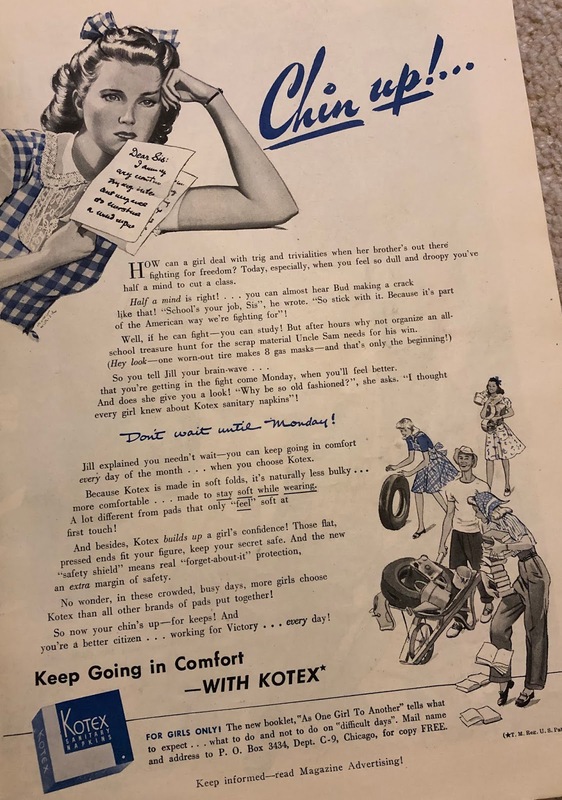 Kotex and Tampax were already well knows brands (even the one time applicator did already exist in 1949 -according to the ad below). The majority of ads in this Cosmopolitan were for feminine hygiene products with a total of 4 ads! Meds Tampons, Ad from 1949. 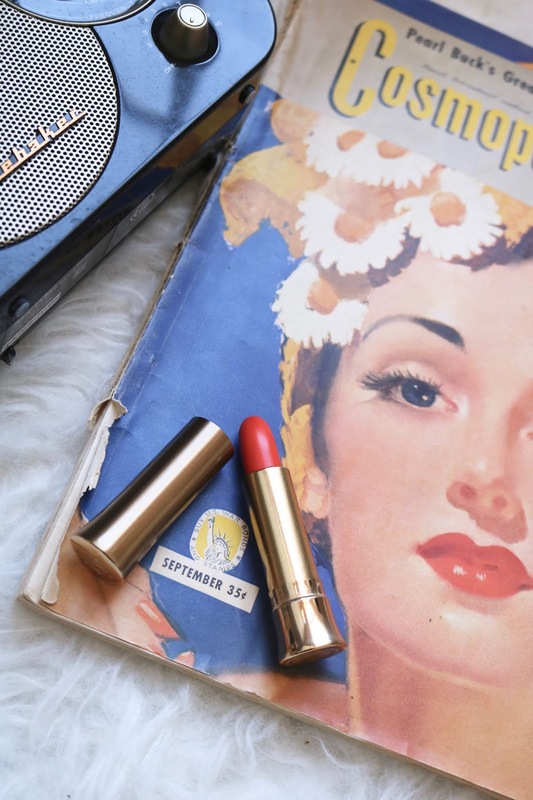 Fun fact: a box of 10 tampons did cost 25 cents in 1949! The scary part? Women had to use belts and pins before tampons? Oh no! Also worth to mention: "Good Housekeeping" awards were already a thing! Who knew? Now this one sounds a little scary to me: Lysol to disinfect NOT the toilet but our private parts? What?!? Surely this can´t be healthy? 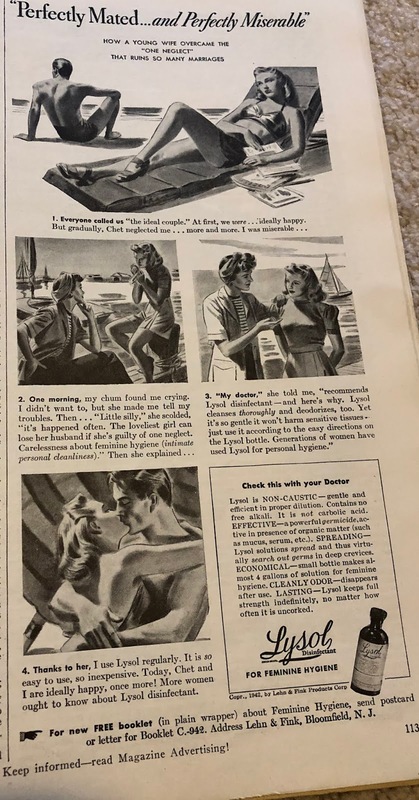 Lysol Disinfectant for feminine hygiene, Ad from 1949. Chet neglected her because she stank lol. But thanks to Lysol they are happy again! LOL!!! I am glad that our deodorants have changed since 1949 and we don´t have to use cream deodorants- and sure enough it seems that none of the 3 brands from 1949 have "survived" either: Arrid, Odorono or Yodora. 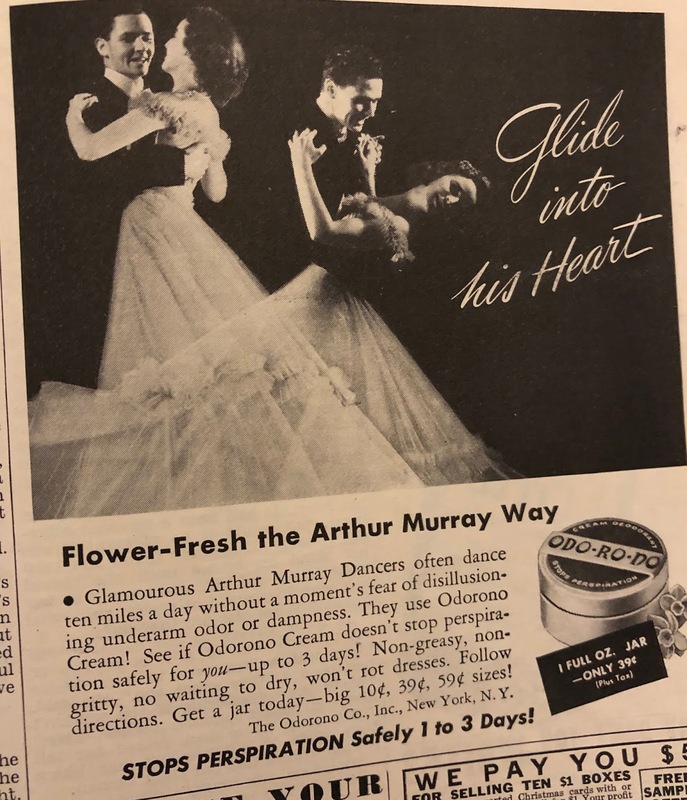 Arrid deodorant cream, Ad from 1949. Odorono cream Ad from 1949. Yodora deodorant cream, Ad from 1949. Keeps Po away? I would immediately associate Po with poo! Haha! Maybe this was on purpose or poo wasn´t a term back then in 1949? 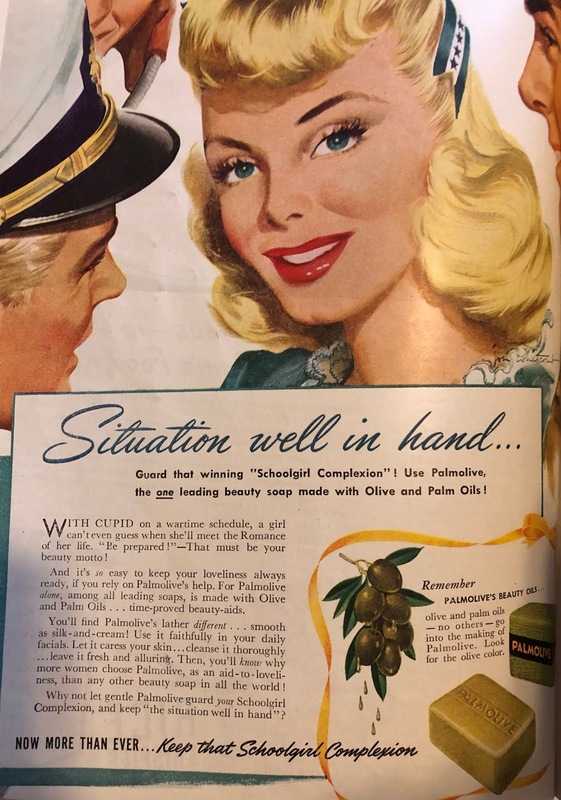 Soap was another big thing in 1949 and I was surprised to see, that the use of olive oil in a bar soap was already a thing in 1949 (see Palmolive ad below). All soap brands exist to this day: Cashmere Bouquet soap, Lux soap, Palmolive soap. Cashmere Bouquet Soap, Ad from 1949. 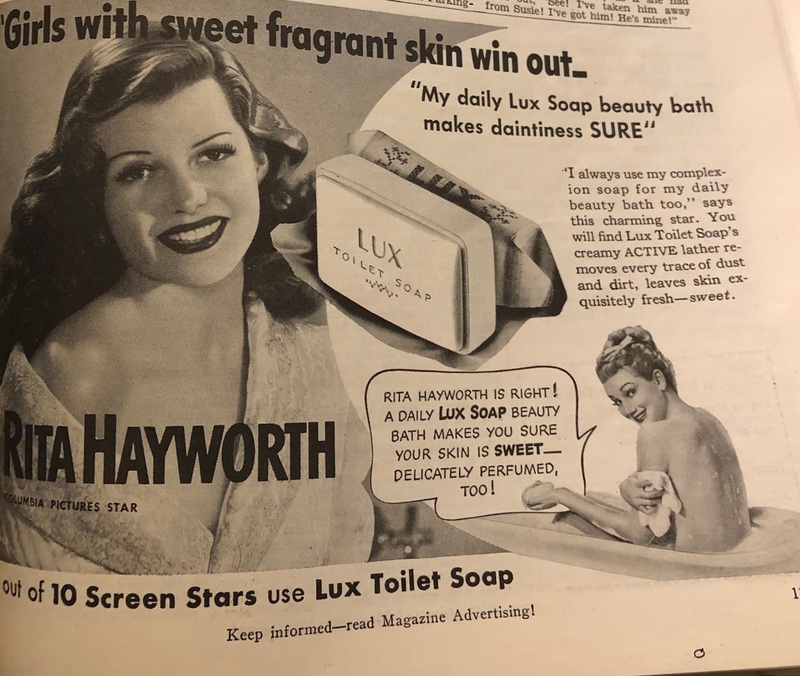 Lux soap ad from 1949. Palmolive soap Ad from 1949. You can still buy this soap! 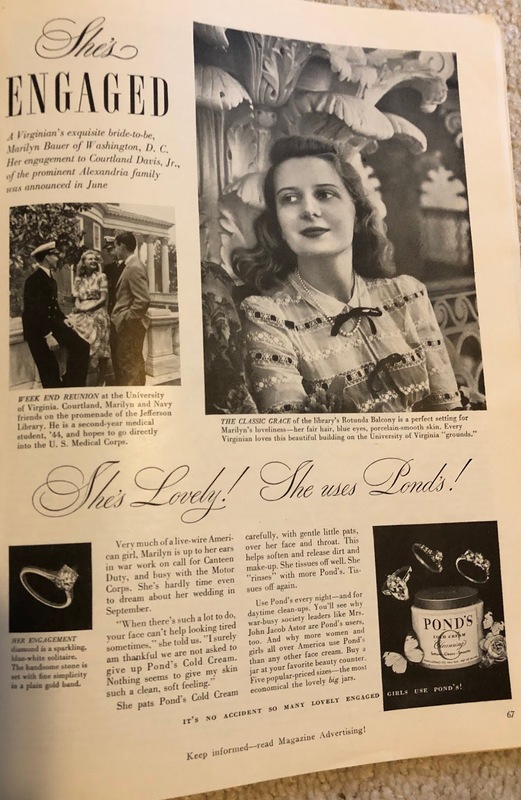 The women in 1949 also had already body lotions: Jergens (still exists!) and Toushay. Jergens lotion Ad from 1949. Interesting that she is learning motor mechanics in 1949! Toushay lotion ad from 1949. Pretty inventive: this lotion was to be used BEFORE hand washing! I found 2 fragrance ads in my Cosmopolitan from 1949: Avon and Tabu. Of course Avon is still around- but even the Tabu perfume by Dana is still available to this day! Avon Cosmetics Ad from 1949. Tabu by Dana Ad from 1949. The only ad for a facial moisturizer in this Cosmopolitan issue was: Pond´s cold cream. Still available today! Pond´s cold cream ad from 1949. 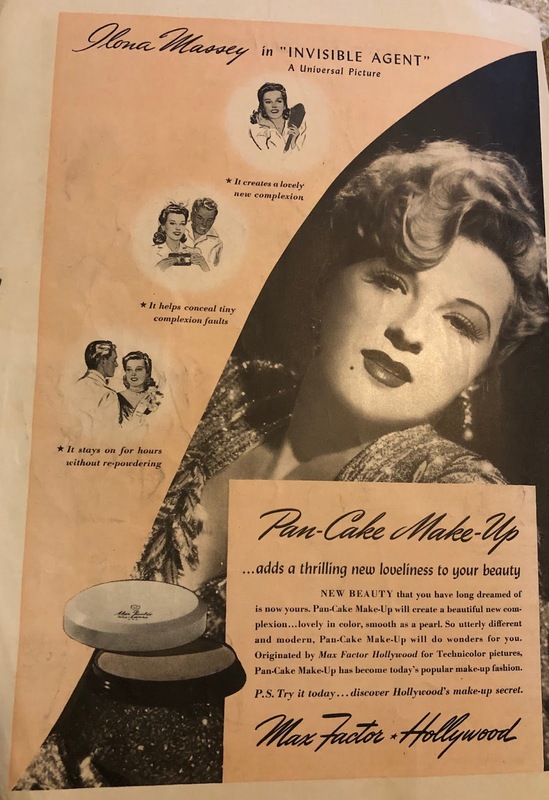 Max Factor Pan-Cake Make-up from 1949. 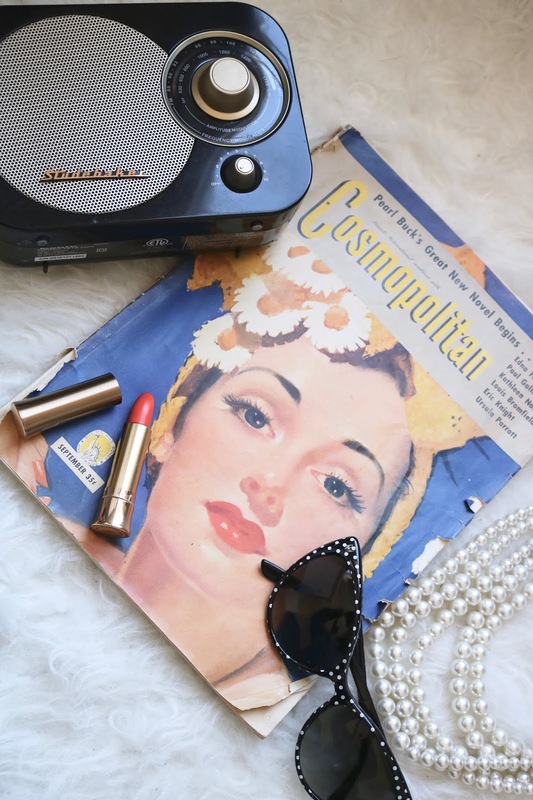 Compared to todays magazines, I would say that today you will definitely find more makeup ads than in 1949, but also a lot more skin care. 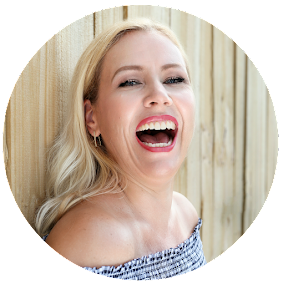 If you love retro stuff- check out my other retro related articles, like the one below: how makeup has not changed over the years!